Categories: Office Chairs, Stressless® Office Chairs. The Stressless® Paris Office Chair, with its sleek profile, combined with the smooth curves, tells a story of a chair with a long design heritage, yet with its eyes fixed on the future. In other words: it’s not set to become a one hit wonder, but will stay in fashion. And of course, it has all the patents and comfort-boosting details of a true Stressless®. 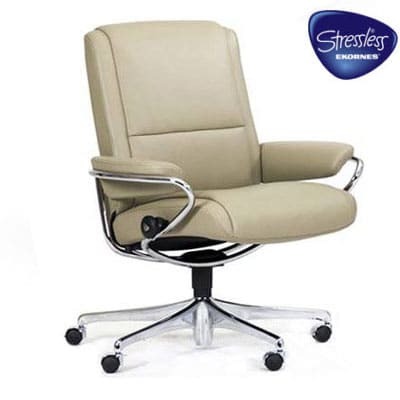 Stressless® Paris also gives you the choice between a high back and a low back model. Customize with your choice of many fabrics and top grain leathers. The Stressless Skyline recliner gets its distinctive looks from a retro-inspired, yet modern pillow design. The sitting experience matches any Stressless, and looks after your whole body. The comfortable neck rest can be adjusted up to 10 cm to support users with a longer back. Customize with your choice from many fabrics and top grain leathers. Nordic design is all about simple, clean lines – modern, yet timeless. Stressless Nordic’s soft and contemporary aesthetics look great alongside several of the Stressless sofa models. The sitting comfort is of course on par with all Stressless models, made possible through the patented features that only a genuine Stressless gives you. Customize the look with your choice from many fabrics and top grain leathers. We know that many of our customers are looking for that classic, robust Stressless. The President is a model built to meet those expectations – a sturdy office chair which provides you with years and years of maximum sitting and working comfort. Hidden under the timeless contours, you’ll find the mechanical precision and unique patents which has made Stressless what it is today: one of the world’s most recognized brands in recliners. Customize with your choice of many fabrics and top grain leathers. 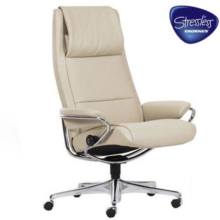 Stressless Capri has the patented Plus-system which provides perfect neck and lumbar support in any angle. Design-wise, it’s all about Stressless heritage – a recliner which invites you to lean back and ease out. Customize the look with your choice from many fabrics and top grain leathers. The Stressless Bliss unites a fresh, modern design with the classic comfort of a Stressless chair. It is all about sleek, velvety lines and sumptuous suppleness. Customize the look with your choice from many fabrics and top grain leathers. Chill out! Piano is the office chair built for moments where you want to slow down the pace and just sink back. An ample, plush top padding sends it right to the top of the comfort scale, in addition, of course, to giving you all the well-known Stressless patents. This office chair combines the ultimate in softness with the sharper contours of a modern interior. Customize the look with your choice from many fabrics and top grain leathers.